On November 10, Senator Jeff Merkley (D-OR) and Representative Mike Thompson (D-CA) introduced the Klamath Basin Economic Restoration Act in Congress (H.R. 3398 / S. 1851). The bill would approve two Klamath agreements and give the go-ahead to potentially remove four hydroelectric dams from the Klamath River. As we have discussed previously on LegalPlanet, this set of agreements represent a long-fought battle to restore the environmental integrity of the Klamath River basin. The Department of Interior, along with other state and local agencies, have released a variety of studies, including a draft EIS on the proposed dam removal. PacifiCorp would pay for the removal. The federal government would contribute an estimated $536 million for environmental restoration. According to studies to date, dam removal would increase median adult chinook production in the Klamath basin by 81%. Removal would improve water quality, reduce fish disease and create thousands of jobs (see L.A. Times summary), including fishing and agricultural jobs. It is probably no surprise, however, that supporters of the bill anticipate strong Republican opposition to the bill. The Siskiyou Daily News quotes Rep. Tom McClintock, who calls the bill an “insane” effort to “tear down four perfectly good hydroelectric dams at enormous cost to ratepayers and taxpayers.” The Siskiyou County Board of Supervisors objects to the removal and the Hoopa Valley Tribe objects to the termination of tribal fishing and water rights as part of the settlement agreement. The reservoirs behind these dams promote the growth of toxic algae and exacerbate agricultural pollution in the Klamath river. Vast stretches of the river have been closed repeatedly in summer months due to the toxins from this algae. Construction of fish passages and other mitigation—which would not address the pollution problem—would likely exceed the cost of removal. And these “perfectly good hydroelectric dams” contribute only 165 MW of power to the region. Compare that to the Ivanpah Solar Power Facility—370 MW—or the trough solar power plants built in the 1980s near Barstow—354 MW. While 165 MW is certainly a decent amount (enough to power approximately 70,000 homes), this large-scale hydropower is neither clean nor cost-effective. The opponents to this bill probably have valid opposing viewpoints on the allocation of fishing and water rights and the distribution of costs for removal. That is to be expected in any difficult settlement agreement. But the basic science and cost-benefit analysis is irrefutable: these hydropower dams do more harm than good and cost less to remove than to keep in place. And if this bill fails, we can expect decades of litigation to resume. I think we can all agree that more litigation is not what the Klamath Basin needs. Unfortunately there is a lot of fluffy data in this article… At the core of this movement to take out dams is great corruption. Follow the money and you will really have a great article to share. 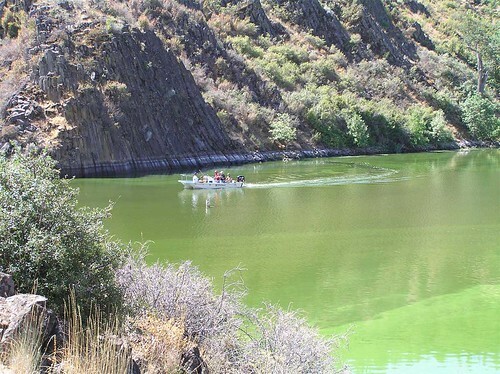 The core studies of the Klamath Lakes show that the “contaminate” sources are actually the natural environment – elemental phosphorus from the rocks will always blow into the lakes (its a volcanic zone). And that toxic algae… thousands of health minded citizens across the world take it daily, it is not deadly but quite the opposite. My 82 year old mother-in-law has been taking Klamath Blue Green Algae supplements for years and raves about it! The local pHD, engineering good minded residents are the best land stewards the area could have and have been supplying the Fish and Game and DOI with data for years about the inaccuracies in their studies. They are continually pushed aside. Why? Not for the fish. It is not likely they will increase in numbers as they are released in records numbers by the fisheries (far more than ever were in these waters). The problem is that they don’t return from sea… protected sea lions, un-monitored Tribal gill netting, modern fishing and record numbers of Coho North of CA waters could have something to do with it. But there is an opportunity for a large land grab by the government, land trusts, the Ruby Pipeline and letting Pacific Corp be excused for what was once inexcusable violations of environmental violations. This is not about fish, but corruption and misuse of power. Local citizens have seen ridiculous hikes in water master fees, fish and game regulations, timber industry wiped out, decline in their economy, devaluation of their land, “volunteer” water right retirement programs and a tanker load of propaganda produced for “laymen”. Who pays? The local residents of one of CA poorest counties will, the tax paying citizens of CA and now all tax paying citizens. The benefit? We “potentially” could see more of the truly non-indegenous Coho. But why should that stop the govt., PacificCorp or NGO’s… they see green! Meanwhile as sediments are burst down the river with a multitude of species’s existence is threatened by the very act (including endangered and Coho), tribal lands and homes will all be exposed to drought and floods. Not to worry, the “restoration” and “rewilding” plan includes provisions to build bridges, take out lake ecosystems and reroute rivers, create catch and haul systems and fish storage for the blast and all natural drought years to come, turn some ranches to dry land to send more water to Upper Klamath Lake while other ranches are turned to wet lands to store more water. And it only costs us 800 million, plus $250 million in proposed water bonds, plus tax hikes, plus new energy fees, plus all mitigation expenses and everything else we have not been told. Welcome to American… Where property rights, the 3rd and 10th Amendments are becoming a joke! I know people up there who are loosing the only home they know … Thompson is an elected official, crooked as they come and must go! And I have never seen the lake that green! Search Google images for more accurate photos. And for an in-depth scientific discussion of all aspects of the Klamath dams, including environmental harms, the best starting point is Interior’s http://klamathrestoration.gov/ website. Dam removal opponents keep trotting out the same tired “faux facts” like Ms. Riter above. It’s all about money, the Coho aren’t native (an easily refuted fantasy), the floods are coming (real hydrologists figure a 7% greater swing in flows *maximum*, and they’re adding more flood-diminishing water storage in the form of wetlands than we’re losing by taking out the small reservoirs), on and on. Then there’s the saw about concern for property rights; the dams are private property, and the private company that owns them doesn’t want to operate them at a $20 million annual loss (FERC estimate of profitability after dams are upgraded instead of removed). But when it comes to dams, suddenly socialism is OK? Maybe Siskiyou County — which is fast becoming wingnut central (it’s an accepted fact up here that this is all part of a plan to run everyone off their land in order to return all this to wilderness) — should just buy the dams and operate them. The Board of Supervisors need yet another way to bankrupt the county. Ms. Riter even mixes in things wholly unrelated to the Klamath dam removal, like the hikes in watermaster fees in Scott Valley (the state decided it wouldn’t subsidize the cost of a watermaster with taxpayer dollars any more), the ongoing dewatering of the Scott and Shasta Rivers, and plenty more. It gets old. There are legitimate reasons for question the KBRA and dam removal legislation, but amazingly, they’re almost never really touched on. The dams will come down because if they were relicensed under current law they would lose $20 million a year. With Warren Buffett behind it, PacifiCorp has negotiated a sweetheart deal to offload the non-performing assets. Clever feds and their “diverse” allies want to hitch a bad water deal to that train. A deal that puts privileged federal irrigators ahead of fish, that ignores the best science, and that favors some tribal, irrigation and environmental interests over other tribal, irrigation and environmental interests will not restore the Klamath River or recover Klamath Salmon. The bottom line is that the Deals will only provide Klamath River flows which will prevent jeopardy to salmon. But what we need is flows that promote salmon recovery, i.e. abundance. Shame on those allies who allowed two environmental organizations to be kicked out of negotiations because they would not sell out the Klamath Wildlife Refuges; that was a sure sign that nothing good would emerge from the backrooms where the deals were cut. The quickest and surest road to dam removal is to jettison the bad Water Deal, get the Klamath out of a partisan Congress, and return to the FERC process where dam removal will proceed as it has with PacifiCorp’s Condit Dam in Washington State.